A newspaper article published by The Central Florida Press on June 20, 1930. The article discusses the runoff primary election for a state and county offices, which was held on June 24, 1930. The race for Florida Secretary of State was between Robert Andrew Gray and Henry Clay Crawford, both Democrats. Presumably, Crawford was the son of Henry Clay Crawford, who served as Secretary of State from 1902 until his death in 1929. William Monroe Igou served as interim secretary until Gray was elected in 1930. Gray served in that position until 1961. Other races discussed in the article include a run-over race for Seminole County Commissioner between W. S. Enztminger, C. B. Searcy, and H. E. Fuller. However, according to the article, the election had been suspended due to the withdrawal of Entzminger, leaving Searcy as the county commissioner for District 3, which consisted of the Town of Longwood. Original newspaper article: "Gray, Crawford in Second Race: Second Primary Tuesday, June 24." The Central Florida Press, Vol. 1, No. 9, June 20, 1930, page 1: Oviedo Historical Society, Oviedo, Florida. Digital reproduction of original newspaper article: "Gray, Crawford in Second Race: Second Primary Tuesday, June 24." The Central Florida Press, Vol. 1, No. 9, June 20, 1930, page 1. 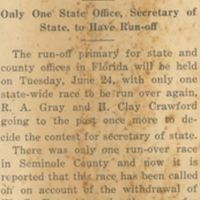 “Gray, Crawford in Second Race: Second Primary Tuesday, June 24.” RICHES of Central Florida accessed April 20, 2019, https://richesmi.cah.ucf.edu/omeka/items/show/5677.